PressureJet Systems Pvt. Ltd supplies hydrostatic pressure testing equipments. Pressure Jet Systems Pvt. Ltd offers high pressure, reciprocating triplex plunger pumps, etc. Hydrostatic pressure test pumps & unit offers "Hydrotest" which is a diagnostic technique. Hydrotest of pipes, tubes, hoses, cylinders, pressure vessels, boilers, cross country pipe lines, valves, castings, components, etc are used for leaks or defects. The hydraulic pressure testing equipment to be tested is filled with an incompressible liquid, usually water or oil. With the help of a positive displacement reciprocating plunger pump incorporating appropriate safety relief and controls, the pressure of the test component is slowly increased to a predetermined set point and held for a predetermined time. Pressure Jet offers wide range of hydrostatic hydrotest pumps ranging from 1 lpm to 773 lpm and pressure up to 2800 bar. 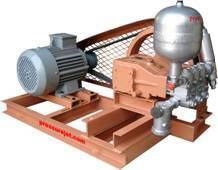 Hydraulic pressure test pump is either electric motor driven or engine driven.